Sound can be an interesting thing. Especially when referencing sound in firearm suppression. If you've been toying with the idea of buying a firearm silencer, and have done a bit of online research, it's very likely that you've come across lots of claims about the "quietness" of certain makes of suppressors. And you probably would like to know that the suppressor you're thinking of buying performs as advertised. We thought it might be good to make a few references of actual, real-life sounds that most of us are familiar with, to help put things in perspective. These sounds are measured in decibels. So, first of all, let's talk about decibels. The decibel (dB) is a logarithmic unit that indicates the ratio of a physical quantity (usually power or intensity) relative to a specified or implied reference level. A ratio in decibels is ten times the logarithm to base 10 of the ratio of two power quantities. Being a ratio of two measurements of a physical quantity in the same units, it is a dimensionless unit. 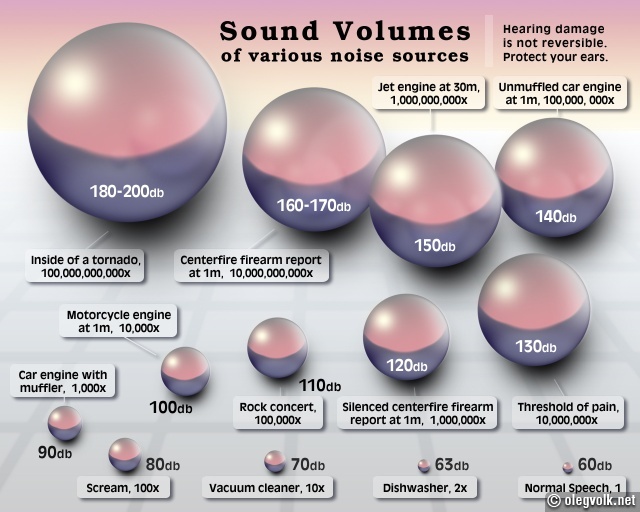 To better understand what that means in terms of how we perceive sound, look at this chart of various sounds and their respective decibel measurements (click the image to enlarge). Notice that with each increase of 10dB, the sound is 10 TIMES more powerful than the original reference point. So, if you start with 60dB (normal speech volume) as reference point, and you introduce a sound that measures 120dB, the power hasn't doubled (i.e. 60x2 = 120)... it has actually increased by 1,000,000 TIMES! You compute that by assuming that your 60dB reference point is one one "unit". With each 10dB increase, the power of the sound increases 10 times, therefore 70dB is 10x more powerful, 80dB is 100x more powerful, 90dB is 1,000x more powerful, and so on. Now, let's relate that to the sound we get get from firearms, both unsuppressed and suppressed. The firearm sound levels represented here are absolute sound levels. Instead of adding variables such as the differences between supersonic and subsonic bullets, these examples are simple, realistic, everyday examples of what you can expect to hear when shooting standard velocity (which are most often supersonic) ammunition from guns you're all familiar with. First, consider the Daisy Red Ryder BB gun. You probably know what that sounds like when fired. Not too bad, right? It measures in the high-90s. Some more advanced .177 or .22 caliber air rifles will produce voulumes up to about 115dB. Now, look at the chart above again. 115dB seems pretty loud when you compare it to a rock concert which can measure 110dB or higher. But, one important thing to consider is that a gun produces a very quick and short impulse sound. The sound level is not prolonged like a 2-hour rock concert. Another familiar sound that might help put this in perspective is the sound of a balloon popping close to your ears. It can measure as high as 157dB. But it's only for a fraction of a second, so while it doesn't "feel" all that bad, it does produce a high SPL. Firing a .22LR rifle (unsuppressed) is considered by some to be the minimum sound level that can be tolerated without using hearing protection. But, from a bolt-action .22LR rifle, the sound can be as high as 140dB with standard velocity ammunition. That's well above the threshold where irreversible hearing damage begins. Impulse noise beyond 120dB can cause hearing damage, but the limit of acceptable impulse sound according to OSHA is 140dB, so there's a big margin there. To play it safe, make sure you use some sort of hearing protection if the gun you're firing will produce sounds exceeding the 120dB level. And by hearing protection, we mean firearm suppressors, of course. What happens to the sound level when you attach a suppressor to that .22LR bolt-action rifle? With a good suppressor, the sound level will drop to around 112db, in some cases, even when shooting standard velocity ammunition. That's an SPL almost 1,000 times less powerful than shooting unsuppressed. And it's quieter than some pellet guns. What about high-power and larger caliber rifles? A high-power center-fire rifle like the .308 will produce around 167dB when shot unsuppressed. Add a good suppressor, and you'll bring the level down to the low 130s. That's the equivalent sound level of an unsuppressed .22LR rifle being fired. And with the added benefit of reduced recoil, that .308 becomes a lot more enjoyable to shoot with a suppressor. Pistols with and without suppressors. Depending on the caliber, most common semi-auto pistols will produce decibels ranging from the high 150s to the low 160s when fired unsuppressed. Add a good suppressor and you can bring it down to the 125dB to 130dB range. And remember, that 25-30 decibel reduction is actually a 1,000x reduction in actual sound pressure level. Hopefully, these examples have been helpful in explaining what you can realistically expect when you add a suppressor to your gun. If you have anything to add to this post, or you find an error in the data represented here, please post a comment. And when you've done all your research, and you're ready to make a purchase, contact us at the NC SILENCER website and we'll get the ball rolling! This is very good information indeed. I stumbled upon your website and am very excited to find a silencer dealer in North Carolina. I am stationed at Fort Bragg and am very excited to buy silencers from you in the future. Great blog.I now have a greater insight into muzzle report from my rifles & how good/bad my moderators are.Many thanks. I have a universal firearms Enforcer that I lave and will keep till death - the problem is it sounds like a very loud cannon going off - any help? Love your info - is there a listing of weapons spl's with standard rounds anywhere that I can find for further reference. Also if I were to measure the spl where would I put the sound level meter to get a proper measurement? What kind a reduction could I expect from a good suppressor? Sure, it's possible to run a suppressor on your Enforcer. It will need a .30 caliber can, of course. And you'd need to confirm that your barrel threads are the appropriate pitch (5/8"-24TPI is standard for .30 cal) and concentric to the bore. The Mack Brothers Varminter 3.0 is very good, for a direct connect suppressor. And the Silencerco Specwar 7.72 does very well if you'd rather have a quick-detach suppressor. Both perform very well on short barrel semi-auto rifles. FYI, not all suppressors can handle SBRs. Some are downright loud. If I were the governor of NC I would require all firearms sold in the state of North Carolina to have threaded barrels. I would also demand that all suppressors manufactured in the state of North Carolina be sold over the counter to North Carolina residents free of that silly Federal tax stamp and CLEO requirement. The only caveat would be that the suppressor could never leave the state because then the state could no longer be a buffer between you and the feds. I also think that suppressors should be all but mandatory at public ranges. Especially if the firing line is covered. Informative. Can you list the average decibel level of just the sound of the action of a semi-auto .22 rifle such as a Ruger 10/22? I ask as I'm trying to decide if I want to go with a bolt action to pair with my rimfire suppressor to keep things as quiet as possible or if the sound of the action of a semi-auto is so minimal anyway that the convenience of quicker follow up shots with not having to manipulate a bolt is a wiser choice. Excellent information here. Do you have any information that explains how much the decibels degrade over distance. For example, the different in what a person will experience standing next to a shooter, and then, what they will experience say...300 feet away. Thank you.